An Orbital ATK Minotaur IV launch is scheduled for Friday, August 25. This will be a dramatic night launch booked for 11:15 p.m. EDT from Cape Canaveral Air Force Station, Florida. The Minotaur IV will carry the U.S. Air Force’s Operationally Responsive Space-5 (ORS-5) spacecraft, which will monitor satellites and space debris to aid the U.S. military’s space situational awareness. Building on the Minotaur family’s 100 percent success rate, this mission will mark the 26th flight for Orbital ATK’s Minotaur product line and the sixth flight of the Minotaur IV configuration. The Minotaur IV is capable of launching payloads up to 4,000 lbs. (or 1,800 kg.) to low-Earth orbit. Minotaur rockets have previously launched from ranges in California, Virginia and Alaska. This will be the company’s first launch of a Minotaur rocket from Launch Complex-46, managed by Space Florida. Minotaur vehicles are based on government-furnished Peacekeeper and Minuteman rocket motors that Orbital ATK has upgraded and integrated with modern avionics and other subsystems to produce an affordable launcher based on reliable, flight-proven hardware. Rich Straka, Vice President and General Manager of Orbital ATK’s Launch Vehicles Division said that launching from Cape Canaveral Air Force Station expands the Minotaur launch vehicle’s capability to meet specific mission requirements for their customer, and that they are pleased to be able to provide continued launch support for the ORS office with their reliable Minotaur family of launch vehicles and they look forward to a successful launch of the ORS-5 mission. Live coverage of the Minotaur launch and details about the mission are available at. Orbital ATK's Minotaur IV space launch vehicle will launch the ORS-5 mission for the U.S. Air Force as a part of the Orbital/Suborbital Program-3 (OSP-3) contract. ORS-5, also known as SensorSat, is designed to scan for other satellites and debris to aid the U.S. military’s tracking of objects in geosynchronous orbit. For the ORS-5 launch, the Minotaur IV will use two Orion 38 upper stage motors. 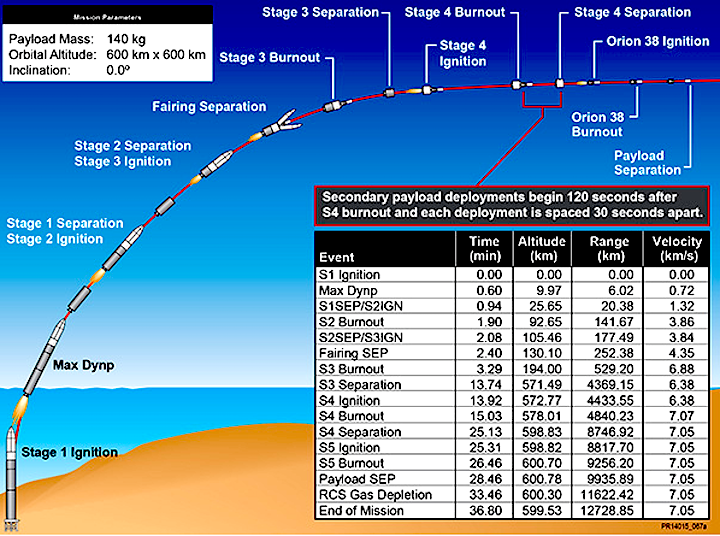 The final Orion 38 motor burn will reduce the angle of the ORS-5 satellite’s orbit, redirecting the spacecraft to equatorial orbit.